Spinal stenosis from spondylolisthesis is a particularly difficult causation of canal narrowing to treat, since severe vertebral misalignment is notoriously limited in its available curative therapy options. Spondylolisthesis is a vertebral misalignment condition which comes in a number of severities, ranging from minor and asymptomatic to extreme and functionally impairing. As with any other type of structural issue in the spine, some diagnoses of spondylolisthesis as the real source of pain are correct, while others blame symptoms on the condition unfairly and incorrectly, leading to misdiagnosis and unsuccessful treatment in the long-term. This article will investigate how vertebral slippage in the lower back or neck can narrow the central and/or foraminal canals, potentially causing neurological dysfunction. Spondylolisthesis describes a vertebral misalignment in which one or more vertebral bones move out of position, either forward or backwards from their relative placement to the bones above and below it. This spinal irregularity can be sourced from different reasons, ranging from congenital causes to arthritic conditions to slippage due to back injury. Spondylolisthesis is a general term for vertebral slippage, while more specific types of the condition are named anterolisthesis, which describes forward vertebral slippage, and retrolisthesis, which describes rearward vertebral migration. Grade 1 spondylolisthesis is the most common and least severe, with vertebral slippage being rated at less than 25% normal position. This accounts for the vast majority of diagnosed patients and is almost never problematic. Grade 2 spondylolisthesis is rated at 25% to 50% misalignment and is usually quite innocent at the lower end of the rating scale and more difficult to predict the effects towards the upper end of the spectrum. Grade 3 spondylolisthesis, rated at 51% to 75%, is usually symptomatic and difficult to live with, while Grade 4 is the harshest, with misalignment rated at 76% to over 100%. These extreme forms of misalignment can lead to disability and spinal instability and are almost always treated with drastic spinal fusion surgeries. Spondylolisthesis almost always exists at L4 or L5, although it can occur virtually anywhere in the spinal anatomy. Obviously as the vertebral bones slip from normal position, the central canal will not line up correctly with the bones above and below, thereby decreasing effective size for the spinal cord and/or spinal nerves to travel through. Additionally, when the vertebral alignment is off, the neuroforaminal spaces also do not align properly, often causing neuroforaminal stenosis and even pinched nerves. These types of spinal stenosis are not easily treated in many patients and most surgical therapy options are almost as bad as the condition itself. Luckily, minor to moderate vertebral misalignment is not usually the cause of pain or neurological dysfunction, although it often acts as a stenosis scapegoat. Just remember this if your minor listhesis is blamed for all your back or neck pain. It should be mentioned that even in minor instances of vertebral migration, the chances of experiencing symptomatic stenosis rise drastically if the patient also suffers other contributors to the stenotic condition at the same spinal level. These may include herniated discs, ligamentous inflammation and arthritic build-up. 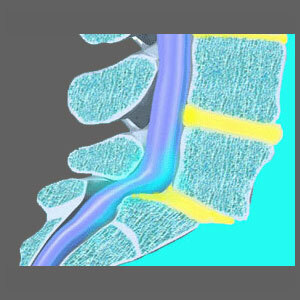 If you are affected by a vertebral migration diagnosis, we highly recommend learning more about the condition from the world’s leading resource at The Spondylolisthesis Authority.